Rogue River, OR (September 18, 2015) – Wagner Meters is proud to share a handy new tool developed especially for contractors, flooring installers, and others in the concrete industry, that enables them to predict the relative humidity (RH) of a concrete floor slab at service conditions – even before those service conditions are met. The widely used and highly accurate, science-based method for measuring moisture in concrete (standardized as ASTM F2170) mandates taking RH measurements at service conditions. But project timelines are often such that contractors would like to be able to estimate RH before reaching service conditions. 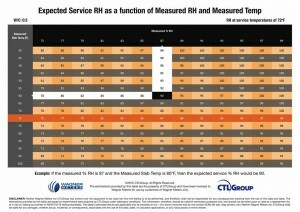 The Service Temperature Adjustment Table (depicted here) is a valuable, scientifically sound predictive tool developed by CTLGroup, a wholly-owned subsidiary of the Portland Cement Association. It’s now being made available for contractors and others to use free of charge, courtesy of a special arrangement between Wagner Meters and CTLGroup. This table is quite simple to use, once you’ve obtained the RH and temperature readings of your concrete slab using a Rapid RH® kit or other similar RH testing materials. Learn more by watching the video here, then download the table and start putting this great tool to use. Now any contractor or flooring installer can be more confident than ever about making reliable decisions related to concrete moisture, even before reaching service conditions.